Teaching your kids about money is one of the best things you can do to set them up for financial success in the future. Being that financial security strategies aren’t taught in the school classroom, it’s important to sit down with your kids at home and teach them valuable lessons in financial management. Here are seven things you should teach your kids about money, helping them become better spenders, savers, and investors. Kids usually start asking a lot of questions when they’re 3, 4, and 5 years old, and it’s your job as a parent to answer those questions to the best of your knowledge in an open and honest way. If they ask you about money when they see you using it to pay for things like groceries, explain to them that it’s used to pay for things that the family needs like food and shelter. If they ask where it comes from, explain that you work hard for it and relate it to the job that you do. It’s easy for kids to accept gifts from their parents and not realize the amount of money that has gone into them getting that gift. As a parent, it’s important to teach your kids the concept of accountability. Encourage your kids to save money if they want to buy something they like and to not spend more than their budget allows. The older your kids get, the more you can teach and expose them to. For example, if your kid wants a new bike, tell them to save toward a goal and that you’ll match them if they reach it. As obvious as it may sound, it’s important to remember that you’re your kids’ most influential teacher. If you spend like crazy when you’re shopping, charge up your credit cards, and take out enormous loans to pay for your home or car, then your kids are likely to follow in your footsteps because they’ll think that’s normal behavior. If you’re modeling unhealthy and unbalanced financial habits, you can realistically expect your kids will follow the example you’ve given them. Kids are repeatedly bombarded with information about expensive items, whether it’s a fancy sports car or the wardrobe of their favorite celebrity. The American Academy of Pediatrics estimates that the average American kid sees about 40,000 commercials annually. Unfortunately, for as much as they’re bombarded with commercials about products, they’re not bombarded with knowledge about how to manage their finances. Make it your priority to teach them about both the commercials that are being used to exploit them and the ways they can get around it. Either way, it’s up to you to deprogram them – not anyone else. An allowance not only gives your kids some financial freedom of their own, but it’s a great teaching tool for parents. Rather than handing it over to them on a weekly basis, give them chores to do so they can earn their money. Not only will this teach them the value of a dollar, but it’ll make them think twice on what they want to spend it on knowing that it wasn’t just handed over to them. Kids can get a solid financial footing from a young age by learning how to spend, save, and invest their allowance. It’s never too early to start saving and investing, especially when you start discussing adult expenses with your kids. Although a car or college tuition may be the immediate expenses your kid is saving up for, it’s never too late to plan and prepare for a house down payment or retirement either. Teach them about short- and long-term investments, and how to save for each one. Whether it’s showing them your own investments or giving them a guide to variable annuities, it’s important they know what to expect. While an allowance is an ample way to start saving and investing, it won’t go far unless your kid goes out and gets their own job (if they’re old enough). Also, if they’re not legally old enough, your kid’s initial exposure to the workforce world can start with something as simple as a car wash or lemonade stand. Whatever the case is, your kid will learn how to work for his or her money and what it takes to earn it. 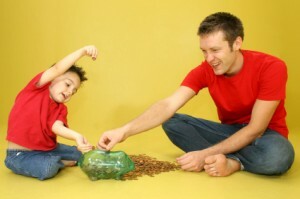 Teaching your kids about money is important to their growth and success in the future. What lessons have you taught your kids about money? Good post. Children definitely need to be taught about money. I learned a lot from my parents, and it has helped me a lot. I’m planning next week that I should open a bank account for my daughter. I always tell her that we should spend money wisely and never buy unnecessary things. Gladly she understands me she is not the type of kiddo that always asked for a brand new dress or toys. Good article. We have taught our son about money and saving from very early on. He understands that is represents work and that it should be saved to make targeted purchases, rather than fulfill impulses, although he does sometimes stop with friends, about two times a month, while walking home from school to buy a hot chocolate at Starbucks. Can’t start networking too soon, you know. He’s 12 years old. I have a 3 month old so it’s too early to teach him about money, but I definitely think it is very important to teach children at a young age about the value of money and how to handle money. I would definitely try to avoid too much TV as that is where a lot of the advertisements they see are on. And, I think having an allowance is a good way to teach them how to handle money. Having an allowance is the best way to learn about money, and like you said if you get an early start then you don’t need to work as much to make up for your mistakes. I certainly agree with this article. For me, when it comes to teaching kids about money, the sooner the better, because good money management is one of the valuable skills you can pass on through your kids. I came from a simple family and my parents teach me how to establish good money habits for life, we learn to value money and savings for small goals when we were still young which help us till we get old. Schools don’t teach kids about financial management that’s why as a parents you can teach your children important financial lessons as they grow up. Holy cow, 40,000 commercials per year! That’s an insane number! Wow… kindof really scary. The best thing my parents taught me about money from when I started my first profitable business at age 11 was the concept of paying myself first. They set me up with a savings account where they told me they would match any contributions I made that was at least 10% of what I grossed. At 11, I didn’t know about investing and ROI but I somehow knew that if I put in $50 and it automatically turned into $100 that was a great deal! It worked out okay for my parents too, since I was able to use all of that money I saved up over the years to help pay for my college education.